E-learning has revolutionized the approach of learning which has made the process of learning easier. It has simplified and made the learning interesting at the same time. If you are new to eLearning, there is a huge bundle of knowledge that can be grabbed. The course creation and delivery has come a long way in the past decades. Now, the learning styles are blended by using all the possible avenues ranging from brick-mortar classrooms to the digital tutorials. The instructional design plays a crucial role in development of the course in eLearning. The instructional design is a systematic approach to develop the learning courses and design them accordingly. You can find enough information on the internet about theories, models and approaches towards eLearning. A newcomer has to figure out the useful information from this ocean of the information available. Starting from the basics of instructional designing, the first step is to make the course effective and engaging by keeping the learner’s perspective in the mind. 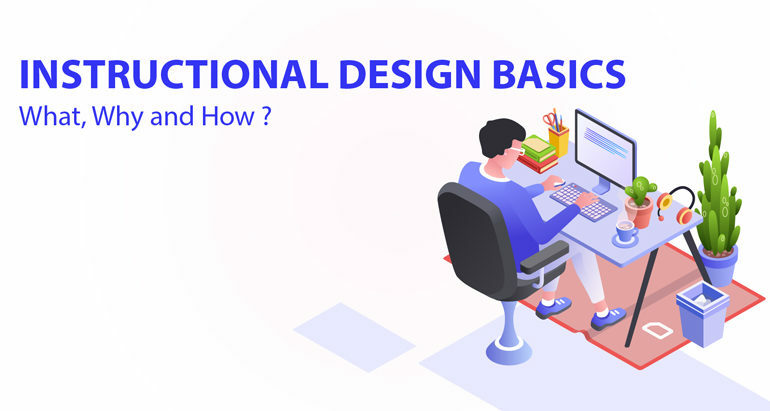 Here are the basics of instructional design, which can help you to get an idea for developing an effective eLearning course; that can help your learner to understand the lesson clearly. The instructional designing needs lots of studies and analysis before developing the course. Your primary focus should be the learner, who are going to learn the lesson. Try to understand the needs of the audience and figure out if the need satisfies the development of the course. There are many check-points in the audience analysis such as; if your audience/learner is tech savvy, what experience they holds, age-groups or so on. Knowing and understanding the background of your audience helps the instructional designer in developing the content that meets the expectation of learner. Everyone can develop the eLearning course but the best course can be developed by designing the basic structure of the module. The module should not be designed only for the sake of educating the learner. To ensure that learning process goes smoothly, one should run systematically. It is always a best idea to start with a welcome note followed by instructions on navigation of the course. Don’t forget to mention the goals, objectives for the learners. Avoid complexity of the content as it can confuse the learner and they can quit the course in between. The interactivity add plus points in the course. Add games, assessments, quizzes as it will give a better experience to the learner. Add the instructions on how to go to next lesson and exit the module. To make sure that your module turns out to be successful, add all the interesting elements that will keep the learner engaged till the end. It is a great idea to start a lesson with a short introductory video narrating; what the learner will get from the course. As the eLearning is totally an online platform, so making your learner comfortable should be the first priority. With the eLearning it should be assured that learner gets the best experience by omitting the complexity of the module. If the module is developed without taking care of the learner, it might be a blunder that an Instructional Designer can commit.